The Order of the Arrow (OA) is the National Honor Society of the Boy Scouts of America. The basic unit of the OA is the lodge, which is chartered to a local BSA council. There are more than 300 lodges in the BSA. 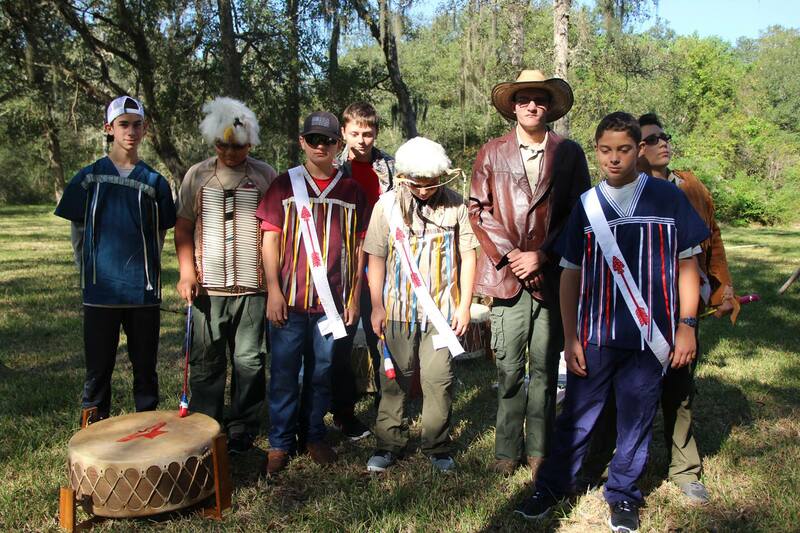 The OA uses Native American style traditions and ceremonies to bestow recognition on Scouts selected by their peers as those that best exemplify the ideals of Scouting. Arrowmen, as they are called, wear a sash over their right shoulder to signify membership in the Order of the Arrow. Membership is good for one full year from January 1 to December 31 and is $12. If you have been selected as a new Arrowmen, make sure you visit the National Order of the Arrow Jumpstart site. It will help you to understand more about the OA. The ceremonies in the Order of the Arrow play an important and meaningful part in bringing new members up to speed on our order, giving Brotherhood candidates greater insight into our purpose and honoring those chosen for the Vigil Honor. No matter which level of membership the ceremony is for, a well rehearsed and carried out ceremony makes all of the difference to those the ceremony is meant for. Our Lodge was founded in 1938 and is affiliated with Bay Area Council #574. The English translation of Wihinipa Hinsa is a phrase derived from the language of the Dakota Nation. It means "Bay Sunrise" which appropriately symbolizes the dawning of a new day, brighter opportunities, a higher vision, and the cheerful spirit forever burning in the hearts and wills of true arrowman. Our Lodge totem is the Sun Rising from the purifying water of the bay. In 1955, Camp Karankawa was opened, offering a well-located camp consisting of 450 acres of heavily forested land, ideally suited to the needs of Scouting. The next few years saw the physical development of the camp's facilities. In 1955, it was decided to build an Ordeal Ring to meet the requirements of the Order's ceremonies. A site was selected on the banks of the San Bernard River. It was reached by following a trail from the chapel area, winding along the banks of the San Bernard, crossing a temporary bridge and finally climbing a hill to enter the ceremonial area. The altar was constructed of stones and a plaque was laid. This ceremonial area served the Lodge for the next 40 years. The temporary bridge ultimately required relocation. Over the years the Brazos River underwent several floods. Each flood required extensive work in removing sand and debris from the Ordeal Ring. The site was lost completely for about a three year period in the mid 1980's, after a very severe flood of the San Bernard River. In the late 1980's it was decided that something needed to be done about the temporary bridge. Each flood had continued to erode the banks to a point of becoming hazardous. A plan was put forth by the Lodge to construct a new suspension bridge. Different ideas were discussed in raising the necessary capital to complete the project. One of which was to sell each of the planks on the bridge and have the names of the donor inscribed on them. Finally the Council Executive Board was approached and money was set aside for its construction. Work began on the new bridge, but a problem immediately arose, it was impossible to get the needed heavy equipment to the site to complete the project. These efforts were finally abandoned. It became increasingly necessary to make a decision on the future of the ring. In late 1994, a site was chosen for construction of a new Ceremonial Ring. Ideas were discussed and a decision was made to move forward with its construction. Through the efforts of several people, and donations of materials, the need for raising capital became unnecessary. During the summer of 1995 several work days were held, and the new ring was constructed. It was made of cement planks that had been donated to the Lodge. These planks were then covered with native stone. Finally the plaque from the old altar was moved to the new site and installed. During the construction phase of the new altar, the permanent smug pots, which had been installed years ago at the old altar were moved and relocated. During the Fall Fellowship in September of 1995, dedication ceremonies were held at the new Ordeal Ceremonial Ring. All ex-Lodge Chiefs and Advisors were invited to attend. Would you like to honor an Arrowmen for their outstanding service to the lodge? Award nomination forms can be found here. The OA Triple Crown has always recognized outstanding outdoorsmen who take the initiative to attend not one, but three high adventure bases through the Order of the Arrow’s programs. Members seeking to achieve the new OA Triple Crown Award can complete any three of the five OAHA programs as long as they do so at three separate bases. These Arrowmen are also expected to give a presentation about their experiences at a lodge or section event encouraging others to participate. Afterwards, they should submit an OA Triple Crown Application which will be made available later this year. After verifying attendance, the Arrowmen will receive a patch set and a certificate signed by the national officers recognizing this accomplishment. The patch set will consist of a universal center patch surrounded by three "rockers" to signify the three programs completed. For more information, please click here. The Founder's Award was created by the National Order of the Arrow to honor and recognize Lodge Arrowmen who have given outstanding service to the lodge. 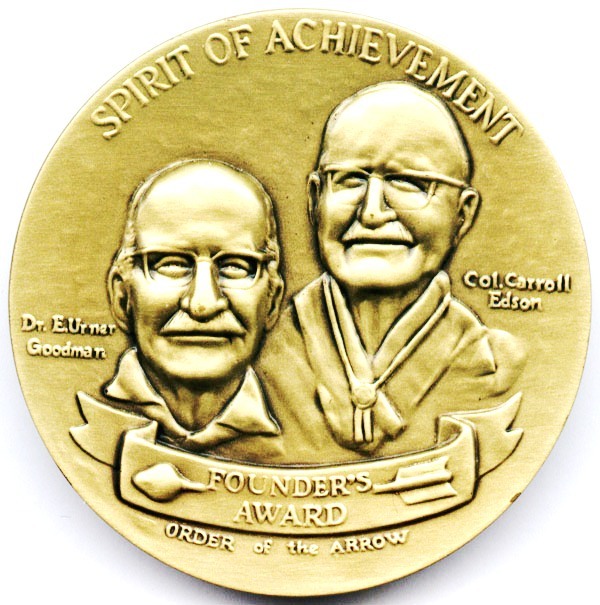 The award is reserved for an Arrowman who demonstrates to fellow Arrowmen that he or she memorializes in his or her everyday life the spirit achievement as described by founder E. Urner Goodman. The award is a handsome bronze medallion bearing the likeness of E. Urner Goodman and Carroll A. Edson, with wooden base and brass plate suitable for engraving. The award is suitable for display at home, or the office. Also available is the Founder's Award arrow ribbon, similar to the universal arrow ribbon, except that it has a gold colored arrow suspended from the red ribbon. Lodges may petition the National Order of the Arrow Committee to present up to two awards annually, based on Lodge membership. If the Lodge presents more than one award, one must be to a youth under the age of 21. The Chief's Award was created to recognize Arrowmen throughout the year for their hard work and service to the Lodge through their dedication to a specific task. At the close of each year, the Chief may select individuals whose work extended above and beyond the call of duty, and who truly live up to the high ideals set for all members of the Order. The main recipients as chosen at the end of the year are awarded a plaque to recognize both their outstanding service and their accomplishments. Because the award is independently selected, awarded, and funded by the chief, he may present as many as he feels appropriate, within reason. No Arrowmen may receive the award more than once from the same Chief, and no awards need to be presented should the Chief not see fit to do so. The Scout does not have to be an OA member and there are no requirements except to fill out the attached application, get your signed approval, and write a 200-word essay on their camping experiences. The funds for these camperships are made available from OA members that purchase a newly designed lodge flap each year for $10 each. We hope that some of your Scouts will take advantage of this program that was started by an idea from our past Lodge Chief Tyler Ray. After two years of service as a Brotherhood member and with the approval of the National Order of the Arrow Committee, a Scout may be recognized with the Vigil Honor for outstanding service to Scouting, his lodge, and the community. This honor is bestowed by special selection and is limited to one person for every 50 members registered with the lodge each year.